Digital photo frames allow users to display their digital photos to be shared with visitors or guests. But can they do more than that? Onkyo LPF10M01 is the latest digital photo frame from Japan which is set to make photos appear sharper and more vibrant. Featuring a display size of 10.1 inch, this digital picture frame has a resolution of 1024 x 600, a contrast ratio of 500:1, and LED backlit for that extra picture vividness and vibrancy. But more excitingly, Onkyo digital frame can do more than just display pictures from its internal memory or external storage devices. The photo frame has HDMI input which allows the photo frame to be used as a secondary display alongside a primary monitor. Available in two elegant colors of black and white, the digital photo frame also features a USB port, 512MB of internal memory and memory card support for SD, SDHC, as well as Memory Stick cards. The frame can be adjusted to portray a 140 degree horizontal viewing angle and 110 degree vertical viewing angle. 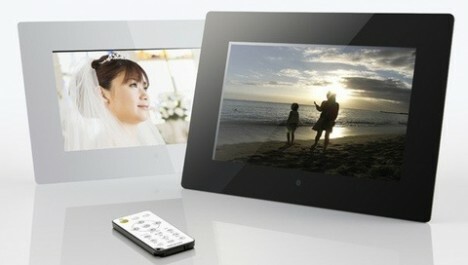 The digital photo frame comes with a remote control for ease of use and control.